Day six of our sporting review of 2014 takes us back to a big but ultimately sad day - and a defeat in the Sussex Senior Cup final at the Amex for the Rocks. Bognor’s second visit to Brighton’s ground was supposed to be the day they made up for the disappointment of the first. 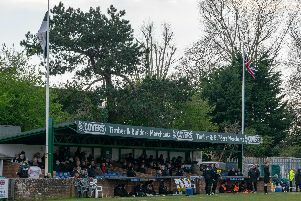 In the end, a defeat to Peacehaven & Telsocmbe felt just as demoralising – if not more so – than the one against Brighton’s development side a year earlier. They were up against a team who had only just been promoted to the Ryman premier, the division in which the Rocks had just finished third. Everything was set up for Bognor to lift the Sussex Senior Cup for the first time since 1987. Or so we thought. Instead, the wait went on. And as they looked back on another final defeat, the men from Nyewood Lane knew they had a chance. Several chances, more to the point, in a 20-minute spell of dominance in the first half when the trophy could have been won but when, as it turned out, it was lost. Jamie Howell’s side ended up well beaten and they’ve now fallen at the final hurdle three times in five years. Nevertheless, the final was a rare low point in another fine year for the team and they end 2014 in among the clubs chasing the play-off places in the Ryman premier.